A Space for All Things Chrome, Google, and More! Oregon-based tech manufacturer CTL has been knocking it out of the park for the past year and they aren’t stopping any time soon. From a fleet of new Chromebooks to the most budget-friendly Kaby Lake Chromebox on the market, CTL is making waves in the Chrome OS market and now they’ve teamed up with Steadfast Innovation to bring together the CTL Chromebook NL7TW-360 and Squid. If you’re new to the Chrome OS landscape or perhaps you’ve just overlooked it, Squid is quite possibly one of the best note-taking apps to use in conjunction with a stylus-compatible Chromebook. As a matter of fact, we’ve thought as much since Android apps first made their official appearance on Chrome OS and we feel the same way today. PDF Import, Tool Pack and Cloud Backup are all available as freestanding in-app purchases but the subscription encompasses all of these features as well as premium backgrounds and future feature updates to the Premium platform. CTL has stepped in and is offering a free subscription to Squid Premium when you purchase their latest convertible Chromebook. The NL7TW-360 is a stylus-toting, Apollo Lake powered device that offers the ruggedness you’d expect from an EDU Chromebook along with the versatility of the convertible form-factor that makes the most out of Android Apps on Chrome OS. Current and new owners of the NL7TW-360 need only to download Squid from the Play Store and the Premium version will be installed automatically. The promotion will remain in place until June 30, 2019, with EDU managed devices being eligible for a discounted subscription at the end of the free year. 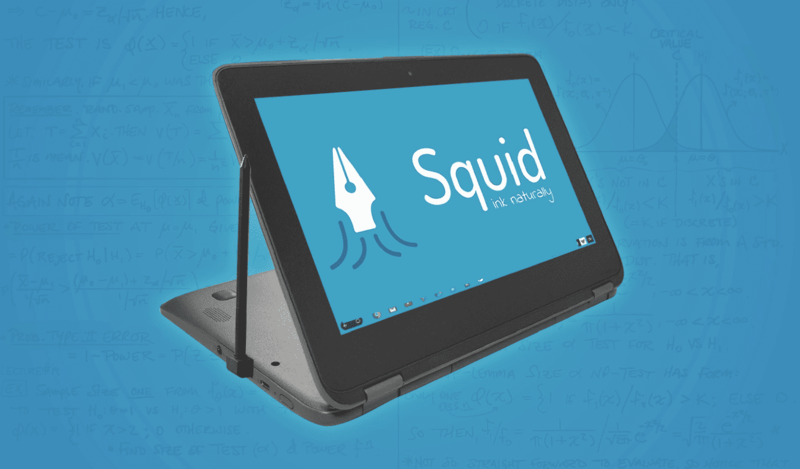 Integrating Squid into our most popular pen-based Chromebook makes the industry-leading EdTech computer even more powerful. It offers a new range of capabilities to our customers and follows our initiative to be a pioneering source of technology in education. The CTL Chromebook NL7TW-360 brings with it the better-of-the-two quad-core N3450 processor from Intel, 4GB RAM, 32GB of storage and is equipped with a Wacom EMR stylus. Education buyers can also enjoy CTL’s exclusive fast-track program that gives you free 2-way shipping on warranty repairs, dedicated Chrome specialists, 5-day guaranteed turnaround and more. Oh yeah, did we mention the CTL costs about $80 less than comparable devices from other Chromebook makers? That’s right. Apart from Lenovo’s Chromebook 500e (which is a steal), the CLT gets you the better processor for a way better price. This, combined with the partnership with Squid, makes the NL7TW-360 one of the best deals on the market for a rugged Chromebook. Stay tuned. We have some more exciting news on the way from CTL later this week. Lover of all things coffee. Foodie for life. Passionate drummer, hobby guitar player, Web designer and proud Army Veteran. I have come to drink coffee and tell the world of all things Chrome. "Whatever you do, Carpe the heck out of that Diem" - Roman poet, Horace. Slightly paraphrased. Copyright © 2019 · Chrome Unboxed · Chrome is a registered trademark of Google Inc.